A soul’s journey through the night, a missing woman: time and narrative bend and interlock across a play of poetic forms and voices to make one story of love and loss. In And She Was Corbett combines the fictional spell-making of Haruki Murakami, with the filmic neo-noir of Atom Egoyan (Exotica) and David Lynch (Lost Highway, Mulholland Drive), to push the boundaries of poetic genre, asking us to renegotiate the way we encounter and reconfigure ourselves through trauma, in desire, or as we seek to reassemble ourselves and our past. November, 3am, and two young lovers are about to meet on the Heathrow Express. A side street in an unknown city: Felix Morning wakes with no memory. In his pocket is a membership card for a nightclub, The Bunker. With the help of the beautiful Flick, he must recover what he has lost. Deep into a dangerous love affair, Esther and Iain believe the other can replace what they each have lost – a heart, a gift – but is Esther’s price too high for Iain to pay, and can their love survive? Who is Esther, where has she come from, and what has she got to do with the woman in the labyrinth? Does Flick belong to the past or to the future? What is memory, and what remains of us without it? And She Was demands our attention, its startling and dazzling writing asking us to be carried away as we read, but returning us by its end to a place both resolved and transformed. 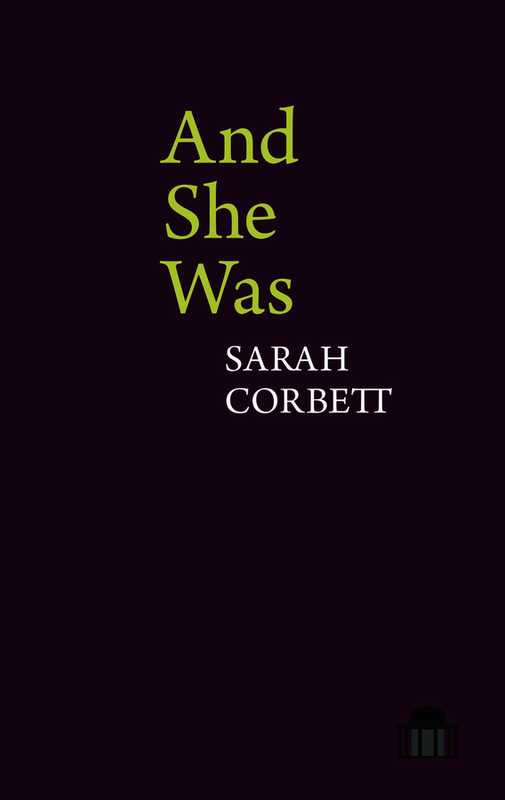 Sarah Corbett’s first collection of poetry The Red Wardrobe (Seren, 1998) won her an Eric Gregory Award and was shortlisted for both the T.S Eliot Prize and the Forward Best First Collection Prize. Described as “Poetry as white knuckle ride” (Poetry Wales), The Red Wardrobe established Corbett as one of the most daring poets of her generation, and was made into a short film (‘The Red Wardrobe’, dir. Gabrielle Russell, 1998). This was followed by The Witch Bag (2002) and Other Beasts, (2008), both from Seren. A selection of translations from the Dutch poet Mustafa Stitou can be found in Uit Het Hoofd/By Heart (Five Leaves Press, 2006). Born in 1970, Sarah grew up in North Wales and studied at the universities of Leeds, East Anglia and Manchester, where she gained a PhD in Critical and Creative Writing in 2013. She currently lives in the Calder Valley and is a Lecturer in Creative Writing for Lancaster University. She was a Royal Literary Fund Fellow in 2012. On Sarah Corbett's previous collection, The Red Wardrobe (Seren, 1998): Poetry as white knuckle ride. 'The kaleidoscopic variations in form and the narrative ambiguity, result in a work that’s both compelling and frustrating. Instinctively, we want to locate the heart of the story, but in many of the poems this heart is obscured or withheld. Yet this is the point: rather than a linear narrative, And She Was is cinematic and strange, an exploration of how memory deals - or fails to deal - with passion and hurt. Born in 1970, Sarah grew up in North Wales and gained a PhD in Critical and Creative Writing from Manchester University in 2013. Her first collection of poetry 'The Red Wardrobe' (Seren, 1998) won the Eric Gregory Award and was shortlisted for the T. S. Eliot Prize and the Forward Best First Collection Prize. She followed with 'The Witch Bag' (Seren, 2002), 'Other Beasts' (Seren, 2008) as well as 'And She Was' (Pavilion Poetry, 2015). She currently lives in the Calder Valley and is a Lecturer in Creative Writing for Lancaster University.